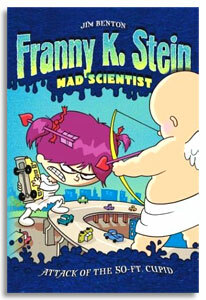 Franny's mom says every mad scientist needs a lab assistant. So for Valentine's Day Franny gets just that - a Lab assistant. Except Igor isn't a pure Lab. He's also part poodle, part Chihuahua, part beagle, part spaniel, part shepherd - and all thumbs. Franny is fuming. She doesn't even need an assistant. What's she supposed to do with a good-for-nothing one like Igor? And things get even worse when a giant, fifty-foot, arrow-shooting cupid starts causing trouble all over town. Franny knows it's up to her - and only her - to save the day. Or is it?